A quick festive stroll around the patch this morning. We got sand-blasted on the ebach by a force 6-7 westerly, a few sanderlings were the only birds of note. On the Budge fields, we showed my father the wildfowl. By the time we left he identified teal, wigeon, mallard, shoveler and pintail there were three of the latter, all drakes. A Yank! But not the one I wanted. 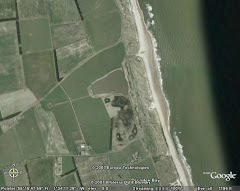 What's wrong with Druridge Pools?